The HM 300 takes combination raking and spreading to improved levels over and above other combination machines. With a working width of up to 3 meters, this machine will handle the heaviest of green crops. 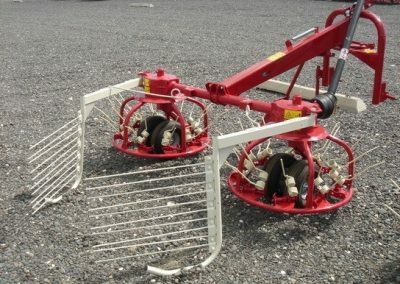 The long vertical tines allow this machine to rake as cleanly and gently as a dedicated rotary rake. When raking, the tine arms travel around a heavy steel cam track which allows the crop to be released into an even row ready for baling or chopping. For spreading, the tine arms are easily repositioned to a fixed position to give an even crop spread.